The winners of this year’s Alberta Steel Design Awards of Excellence have been announced by Canadian Institute of Steel Construction (CISC). The March 21 event, held at the Northlands Edmonton EXPO Centre, honoured six projects for their use of steel in innovative designs and challenges. 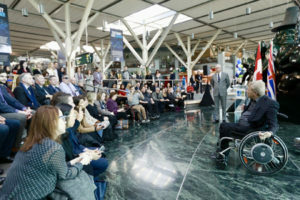 The Vancouver International Airport (YVR) received the Accessibility Certified Gold rating under the Rick Hansen Foundation Accessibility Certification (RHFAC) program for removing many accessibility barriers. Earlier this month, the Vancouver International Airport (YVR) received the Accessibility Certified Gold rating under the Rick Hansen Foundation Accessibility Certification (RHFAC) program for improvements to its barrier-free features. “I have watched YVR systematically make progress on accessibility over many decades. People with visible and invisible disabilities experience accessibility challenges every day and with record numbers of passengers traveling through Canada’s airports, it is critical these spaces meet everyone’s needs,” said Rick Hansen, CEO of Rick Hansen Foundation (RHF). RHFAC measures the level of access a facility provides beyond the building code based on the holistic user experience of people with varying disabilities affecting mobility, vision, and hearing. In achieving this rating, YVR has improved accessibility for employees, passengers, and partners—receiving a score of 93 out of 100 points.